My wife and I signed the “body disposal form” and sat quietly for a moment. That was in 1998 prior to my first 8000 meter climb, drugstore Cho Oyu. We were offered three choices: leave on mountain, return to Kathmandu or return home. We choose to leave my body on the mountain if I died. Obviously I did not but I did help bury a teammate that year on Cho Oyu. Around 225 climbers have died on Everest since 1953 with about 3,700 individuals standing on the summit. The vast majority of the dead are still there. This article will explore where and why plus try to debunk the myths that are fed by sensational reporting. The storied organization, The Smithsonian, posted an article on their November 28, 2012 blog with the title “There Are Over 200 Bodies on Mount Everest, And They’re Used as Landmarks” Other news organization latched onto the story adding more comments that falsely reinforced an image of climbers casually walking over dead bodies on their selfish pursuit of an Everest summit. They also included a picture of a dead climber. Honestly I expected more from the Smithsonian. While I understand a provocative headline will bring readers (and advertisers), there is a responsibility to portray a difficult situation with respect and sensitivity. Taste aside, here are the facts for bodies on Everest as of spring 2012 per my own personal observations on the south and trusted first hand reports from the north. For reasons I will get into, the north side (Tibet) has more bodies than on the south (Nepal). A total of about 7 bodies are visible on the northeast ridge starting below Mushroom Rock (28,047′), then several at the notorious 1st, 2nd and 3rd Steps and finally on the long snow traverse just below the summit. Most are off the route, some behind rocks or in small caves but a few are quite visible and leaving a lasting impact on anyone passing by. As one north side climber told me from his 2009 summit, he saw a “very graphic body on snow slope after 3rd step”. On the south, it is quite possible to climb the entire route and not see any bodies from previous years. However, one and perhaps another from 2012 are visible just above the South Col but below the Balcony. There are other bodies between the South Summit and the summit that have been given a respectful burial in the rock alcoves out of sight of most climbers. While one climber is often cited as a”landmark” on the north, most are passed by with silence and respect. I was told by a south side summitier that he was asked if he took a photo of a body and would he sell it if he did. He said no and no. Others lack this simple respect. As to the question of why bodies remain on Everest, it is a matter of logistical difficulty and further risk. It can take five or even ten or more very strong, acclimatized Sherpas to move a body lower from the extreme altitudes above 8000 meters. 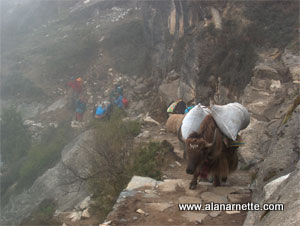 The work is slow and dangerous exposing the rescuers to altitude, weather and potential falls. And it is expensive costing over USD$30,000 for a full repatriation. If several years have passed, the body has most likely frozen into the landscape preventing any form of recovery. Using helicopters to transport bodies has only recently become practical. FishTail Air helicopters regularly carried injured climbers and even d ones from Camp 2 at 21,500′ on the south the past few years. But a body above that altitude must be moved by human power to a lower position. There are no helicopters available on the north due to the Chinese prohibiting the use of helicopters for any reason thus any body must be moved by human power to ABC then by yak to base camp at 17,000′ and then moved by a vehicle. Often friends or guides will return the following year after a death to provide a respectful “burial” of the dead by moving them off route or down a steep hill side. Some are moved into a crevasse or covered with rock or snow if available. However, with climate change, these burials are proving to be temporary as wind and melting snow reveal the bodies years or decades later. Finally, often deaths occur during the harshest of conditions where everyone is fighting for their lives preventing any form of immediate rescue. On occasion, climbers have been known to be literally blown off the upper mountain flanks or ridges never to be found. In 2010, an effort was made by one Nepali guiding company to remove bodies from the south side at the request of the local Sherpa and Lama community. They considered leaving the dead on Everest disrespectful to the Mountain Gods. Two bodies were removed but the families intervened on others requesting they stay where they died per the climber’s wishes. A plan to spread Sir Edmund Hillary’s ashes on the summit in 2010 was halted when both the Nepal government and local Lama’s interceded stopping the plan saying that Everest is holy and should not be used for publicity. That the north side death rate is higher is not a big surprise. The north is traditionally considered slightly more dangerous given the exposure to cold and harsh winds plus the technical nature of the Steps and exposed rock on the summit ridge. Due to historical lower costs, more independent climbers use the north thus sometimes finding themselves alone in the event of a problem. Also, it seems that more climbers do not use supplemental oxygen on the north than on the south, probably due to costs, which also can accelerate altitude issues especially in the harshest of conditions. However, there is no strong correlation between deaths of independent climbers vs climbers on commercial expeditions. Finally, with the exception of 2005 through 2007, the south has had significantly more climbers thus more rescue resources in the event of a problem. Traditionally, commercial operators have focused on the south thus fielding more Sherpas. As far as nationalities, the Nepalese Sherpas suffer the most with 13 deaths the past 12 years almost all on the south side from falls, avalanches and crevasse accidents. 6 South Korean climbers have died but no other single nationality has more than 4 deaths in the past decade. As far as operators, no one operator stood out since the majority of the non-Sherpa deaths were of climbers on private national climbs, large shared permits or were climbing independently. Death is part of climbing high mountains but needs to be taken in context. Each person who died had a family back home. They had teammates who suffered as well. To exploit their death is simply wrong. To learn from their experience is wise. My hope for everyone climbing Everest next spring is that they will return home safely and if they see a body, take a moment, reflect on the person, their goal, the loss. I think any reasonable person would accept that attempts to retrieve bodies would pose an unnacceptable risk to others. However, the mainstream “Everest body controversy” was essentially sparked not by the presence of bodies but by accounts of climbers passing others who were in acute distress and choosing to push-on to the finish line rather than render any assistance. Like it or not, the view amongst many is that this is essentially a recreational activity (yes, a very hazardous one) and whilst those dying climbers may have beyond help, maybe some weren’t. I tell folks Death Zone rescue is akin to wearing roller-skates, on a very steep slope, carrying a refrigerator. Interesting and informative article, thank you. Even worse is the website The Smithsonian links to. I really hate the way photos of dead climbers are pimped around various websites for ghoulish entertainment purposes. They often have incorrect names and misleading and sometimes downright disrespectful comments attached, with no concern that that was once someone’s loved one. This can give you some insights about how Everest is dangerous compared to 8000m summits. Well researched and written Alan. Glad you took the time to do this fact based article. Great article touching the darker side of Everest. It is good to move the body off the main ridge & dropped in a crevasse. A small prayer can be said whenever one comes across a body. A well written and re-searched article Alan, well done. I was there in 2010, ended up with hace,hape at bingboche . Helicopter to kathmandu. 6 weeks in the norvic hospital.. Blind in one eye.. Even at low altitude its still a dangerous mountain.. Very well put Alan. It is easy to jump on the media band-wagon and believe all the sensationalised stories that are played out in the world’s press. One needs to keep a sense of perspective when reading about such stuff. WOW…so impressively written Alan… I read it again and again…. and the first line of your article is so touchy , “My wife and I signed the “body disposal form” and sat quietly for a moment.” Thank you for putting it together.